Hello, McFly? Mc… Who the Hell Are You? 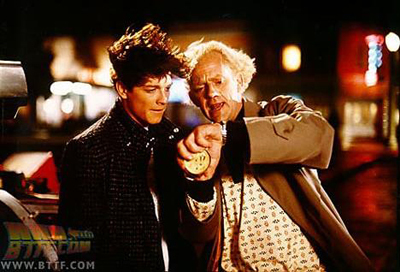 We’ve all heard for years now about how Eric Stoltz was originally cast in ‘Back to the Future’ and shot several weeks of footage before being replaced by Michael J. Fox. For the last 25 years, that original unused footage has been suppressed – reportedly at the insistence of director Robert Zemeckis, out of consideration for Stoltz’s feelings. With the release of the movie on Blu-ray later this month, that’s all changing. For this to be released now, I have to assume that Stoltz himself must have been consulted and must have consented to it. At least , I hope so. If so, good for him. He’s really got nothing to lose at this point. Stoltz has had his own successful career. (He even directed this week’s episode of ‘Glee’!) There’s no sense holding a grudge for 25 years – if, in fact, he ever did hold a grudge about it. Technically, photos of Stoltz in character (such as that to the right) first surfaced a few years ago. You can still find them all over the web if you search. However, to my knowledge, this is the first time we’ve seen any footage in actual motion. Unfortunately, there’s no original audio to go with it – at least not in this clip. This footage isn’t necessarily a huge revelation to anyone, but it certainly an interesting footnote in the history of a beloved movie. I’m glad to see it finally come to light. I sincerely hope there are a few full clips in the Blu-ray – it’d be really interesting to see the difference! In a rescent interview, Stoltz spoke about his departure on BTTF. He said he held no ill will towards the film makers and admitted that he thought, when all was said and done, Fox was the right actor for the part. He went on to say that he was very interested in seeing original footage himself. I am reminded of the old brouhaha over Kate Mulgrew’s last-minute replacement of Geneviève Bujold as Captain Janeway on “Star Trek: Voyager”. For years there had been speculation about Bujold’s footage. Finally, the first “Voyager” DVD set contained a special feature which included the Bujold footage. Unsurprisingly, it turned out that Mulgrew had given the better performance, by far. I doubt the release harmed Bujold’s career, and I think it’s safe to say the unveiling of the footage had no serious impact on “Voyager”, which had come to an end three years earlier. The Bujold footage was a curiosity for fans and it remains an interesting sidenote, and that’s all. While I myself am curious about the Stoltz footage, I imagine that it too will soon fade into “interesting sidenote” status.